CT Engineering Supercharger - S2000 HONDA - Dezod Motorsports Inc - Home of the automotive performance enthusiast since 2002. If you are looking to transform your S2000, the CT Engineering After-Cooled and Non-After-Cooled Supercharger kits are a great start. Utilizing the benefits of a centrifugal supercharger, designed to match the factory power characteristics of the high revving Honda 2.0L power plant. The CT Engineering Supercharger kits will add more power to your S2000 at the higher RPM’s, keeping the car drivable in traffic & day-to-day driving, but throttle the engine to redline & you’ll feel the burst of acceleration from the additional 70-80 horsepower at the rear wheels. 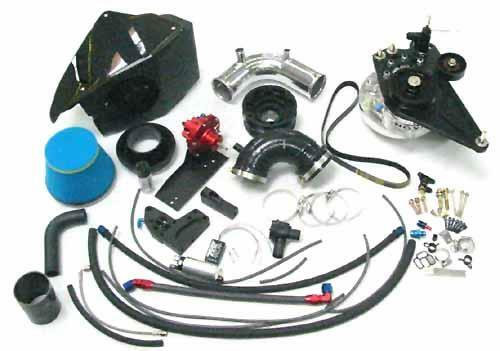 The kit includes the blower unit, icebox intake with a real carbon fiber lid, all mounting brackets, fuel system upgrades (including an in tank Fuel Pump & CT Engineering FPR), all hoses & drive belt and the CT Engineering ESM unit. 310-320 horsepower at the crank. 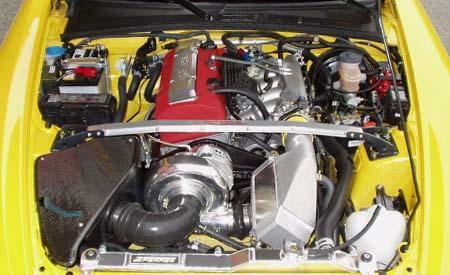 Utilizes a very efficient gear driven centrifugal supercharger and is a simple bolt on kit. Cooler housing designed with popular blow-off valve bolt pattern on by-pass valve outlet, for those who want to run higher than standard boost levels. This kit is designed so that it can be removed without any modifications to the factory components. After-cooled kits designed to lower inlet temps by 50-70 degrees F.
Highly efficient cooler unit losses less than 0.5psi boost. 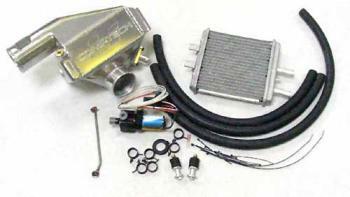 After-cooled kits also include after-cooler, after-cooler radiator, water pump, and all necessary hardware. Note: Warranty is void w/ higher than standard boost level. Requires $200 for a core charge for the factory crank pulley – this is NOT included in the price of the kit.